MADISON, WI. If you would have told any of the fans, referees, coaches, or players on the field last Saturday at Breitenbach Stadium that it was a night in April, chances are no one would have believed you. 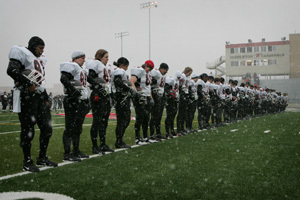 Just as the National Anthem was being sung, a wintry snow blizzard blew in from the north and covered the field in a sheet of white. The weather conditions made it tough to grip the ball, or run without sliding. The game wasn’t very pretty or easy as there was no quit in a good Wisconsin Wolves team. When the final horn sounded to end the game, the Force posted a 14-7 win to go 1-0 on the young season. After a defensive battle for most of the first half, the Force struck first. With :57 seconds remaining and the ball sitting at the 17 yard line, QB, Sami Grisafe hit a streaking rookie WR Brandi Srda down the left sidelines. Srda did a nice job eluding the defensive backs for the touchdown. The two point conversion failed and both teams headed for the warmth of the locker room with the score 6-0. On the Force ensuing kickoff to start the third quarter, Wolves RB, McGee Steffes took a punishing blow from Lori Kunc, resulting in a fumble, recovered at midfield by Michelle Kania. The Force marched down the field with good blocking by the ‘O’ line, and 8 plays later, Grisafe ran a QB keeper around the left end. Rookie RB Marcie Myers ran through the middle for the 2 point conversion. 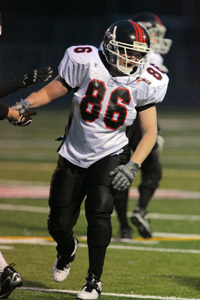 Running back Melissa Smith ran the ball four straight times to help set up the winning touchdown. Smith who was slowed by injury in '07 was in mid season form rushing for 108 yards on 18 carries, by breaking tackles and bulldozing her way to big yardage." Melissa is our workhorse, she hit's the hole hard and is very difficult to bring down", said Head Coach Jim Stahl. 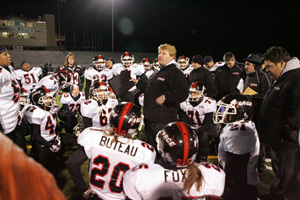 The Force defense led by second year linebacker Dawn Pederson gave up just one first down on the night. Pederson came out 'old school' going sleeveless. The cold didn’t seem to bother her as she was in on most tackles. "Pederson has great athletic ability on both sides of the ball," added Stahl. "As a second year player, we really see this game as a breakout for her, and expect big things all season." The Force host the Detroit Demolition this Saturday in the first ever night game at Holmgren Athletic Complex. Game time is 7pm.